This monument features a replica of The Builder, one of two reliefs, the other being The Architect, set into the exterior wall of Gerard Gardens; tenements demolished in 1987. The Builder was saved from the demolition ball by the artistic sensibility of one of the contractors who drilled out the Tyson Smith relief even though the boss had told him to ‘smash it to pieces’. 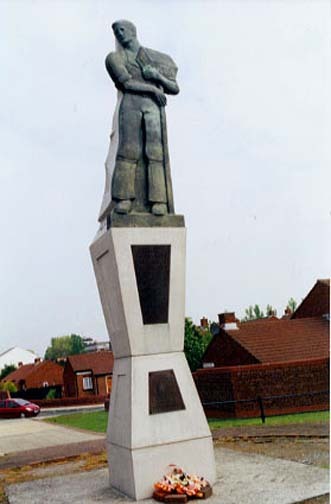 The Riley statue is dedicated to those who have lost their lives in the construction industry. The plinth is dedicated to the former residents of Gerard Gardens. Some think it too fine a work to be so isolated beside the roaring multiple lanes of traffic that comprise Hunter Street, but it is proximate to its original site and joins a long list of sculptural work in Liverpool remembered, revered and recovered through community action. Sources: The Public Sculpture Of Liverpool by Terry Cavanagh & Pevsner Architectural Guides: Liverpool by Joseph Sharples.